COMET 203597 DRIVE BELT. COMET INDUSTRIES 994-110 BELT. Home > COMET INDUSTRIES BELTS > COMET 203597 (A or DF). COMET INDUSTRIES 994-110 BELT. COMET 203597 (A or DF). COMET INDUSTRIES 994-110 BELT. COMET 203597 (A or DF). COMET INDUSTRIES 994-110 BELT. Replacement belt for Comet 30 series. Specs: 3/4"top Width x 35-9/64" L. *Asymmetric* Cogged belt. Used in ATVs, Go Karts, Mini-Bikes, and other Comet 30 Series torque converter applications. 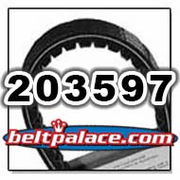 994-110 OEM Comet Industries Belt. Comet 219464A Driven Clutch Unit. 3/4" Bore. Comet 31D-7 Driven Clutch. Comet 219464A Driven Clutch Unit. 3/4" Bore. 7" Diameter. Comet Industries 31D-7 Driven Clutch.